The Japan Podcast -- Episode 075 -- "How to Save Money in Japan"
The "Save your change daily method". Don't join a gym, hit up the local parks and sports parks, get off the train one or two stops earlier and walk. While halfway through recording a solo episode of the Japan Podcast I managed to catch Anthony "The Crank" on Skype, so we had a nice 30 minute conversation. He gave us the pre-summer update. It was great to catch up with him, and I predict more shows with both of us in the future!! Become a Patreon by supporting the show! 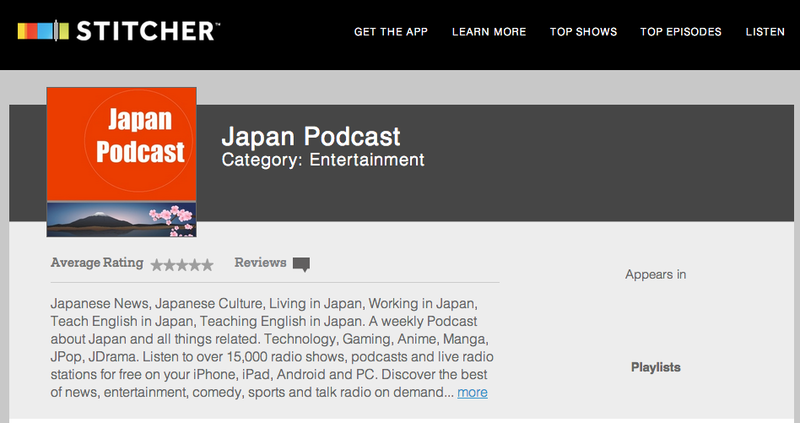 The Japan Podcast is Now on Stitcher!! Hey folks, check this out!! We are now officially on Stitcher (^_^) So, for those that don't like iTunes or are a big fan of Stitcher's app for Android and iOS....Subscribe to our show. To help give The Japan Podcast the boost that it needs, we are launching a Patreon Campaign. With as little as $1 per episode your patronage will help us continue to bring you the podcast, and allow us to start adding more exclusive content, that I have no doubt will be valuable to you. Thanks for all the support with our Patreon Campaign!! In this episode of The Japan Podcast we answer a listeners question about teaching in Japan without a degree. Our listener has a somewhat unique situation with a "Child of Japanese Visa" (i.e. His mom or dad is Japanese). In the podcast I answer his question and give him some advice and recommendations. Well, what do we have here? It looks like a new style vending machine in Japan. 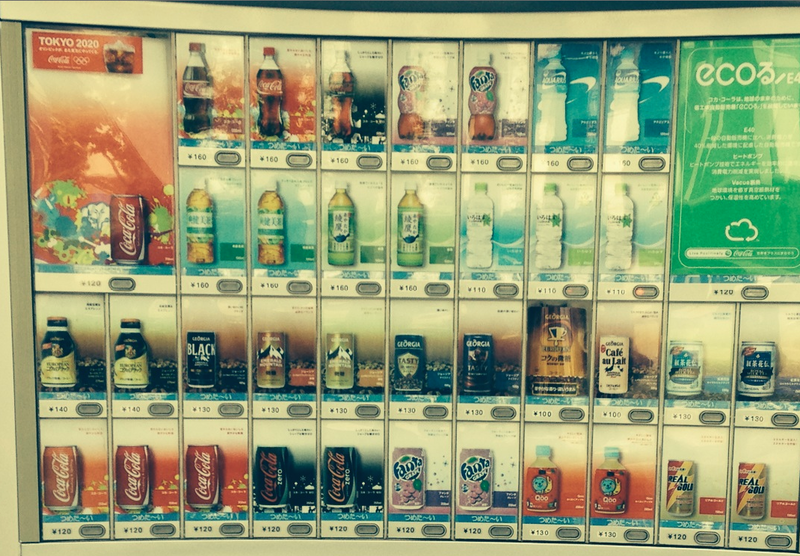 Here I blew up the picture a bit so we can do a price check on drinks in Japan. Looks like the prices went up a little bit. Deals can still be had if you go to supermarkets or grocery stores. Don't forget to recycle when your finished with the bin next to the machines. They are labeled so you know what to put where. Just got of the Skypes with Anthony "The Crank" and he was nice enough to share some of his pictures from a trip to Yobuko in Karatsu, Japan. Yobuko is famous for one thing and one thing only....SQUID! Otherwise known as "Ika" イカ in Japanese. The waters off of Karatsu have lots of squid and other fresh fish. Below is the bridge to Yobuko. I have also had the pleasure of going to Yobuko on several occasions and have to say that if you want fresh delicious Ika, Yobuko is the place to go. Basically, the way it works is that the staff grabs a live squid, cuts it up a bit, puts it on a plate while it's still moving, squeezes lemon on it and it changes colors. Next you eat the Ika sashimi (raw squid) for a while, and then when you are ready to make tumpura fried squid with the remaining parts of the squid you didn't eat. In most parts of Japan there are sea walls just about everywhere. You will always see people fishing off of them. Just a quick update to let you know what's going on. Stay tuned for a full episode later this week. Over 2500 unique products from Japan -- click now! Before you shop at Amazon just go through our link and you help to support TEIJG. This will cost you nothing at all, but we get a little affiliate commission from Amazon. Awesome Inc. theme. Theme images by Terraxplorer. Powered by Blogger.